A wonderful thank you to Precious Moments for sending this beautiful ornament to review for my honest opinion. As a child, you'd love to see Precious Moments whether it be in the newspaper, on desks, and especially at Christmas. I loved seeing ornaments that involved those cute little children and their pets. Giving gifts to each other, smiling their cute little smiles, it just made you warm and fuzzy. Today, I get to review a special ornament that I know any family would cherish forever. 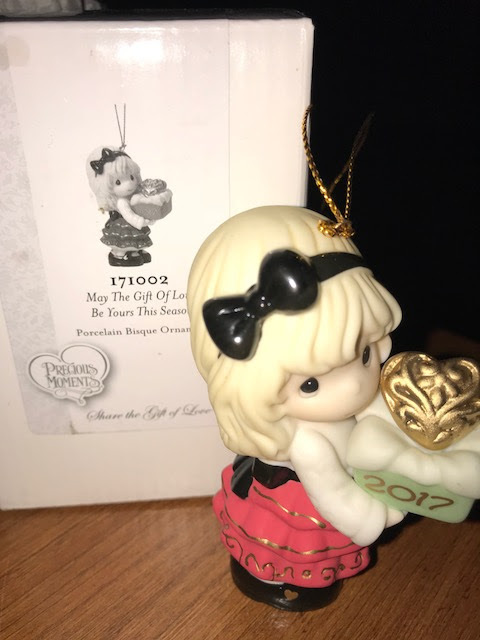 This is the Precious Moments "May the Gift of Love be Yours This Season" ornament. As with any Precious Moments piece, this is authentic to have it's own number letting you know no one will get yours ever. The first thing I saw when I opened her up was the intricate gold heart on top. I loved it, considering the remaining colors are pale/pastel which is definition of Precious Moments, I loved how it stood out and brought the entire ornament together. Can you see the difference in the black shoes to the black tie on her skirt and bow? Very shiny on two but the shoes aren't. Another special detail. I love her dress, I actually want to find one just like it for my daughter for Christmas! 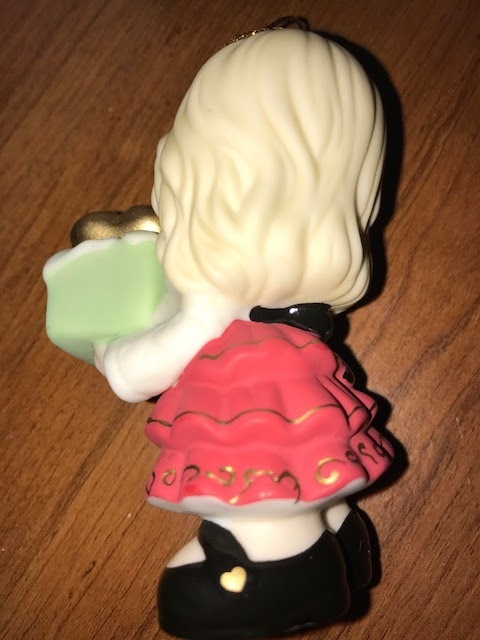 Even all the way down to the flowing locks of the hair this ornament is just absolutely well...Precious. It makes for great conversation at the Christmas tree reflecting love and joy. 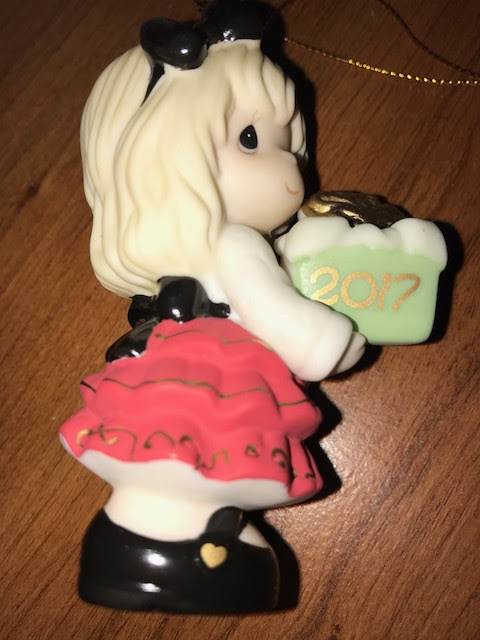 I also love the present, the green is a great color that brings a certain Christmas charm as well; and of course with the 2017 date you will always remember the year you received it or gave that to someone. No matter what side you see, you can see the beauty of this ornament and feel the love. I absolutely adore this ornament, I think on my tree she will be sitting high next to my Great Grandmother's hand made ornaments. They are at least 50 or 60 years old, and every year I ensure they are at the top of the tree to shine with the lights. I believe my sweet Precious Moments girl would accent those snowflakes very well. You can get two different styles of this ornament, one as you see and one as a ball ornament. The ornament style you see here currently is SRP: $25.99 and the ball ornament is SRP: $30.99. With Christmas right around the corner make sure to order yours today. You can find them at Hallmark, Amazon, and PreciousMoments.com!